We are thrilled to announce that Gumby has an all-new series of comics by Papercutz, the #1 publisher of kids’ graphic novels. Three brand new issues launched beginning in July 2017, and Gumby’s first graphic novel, Fifty Shades of Clay, debuted in November. In the true spirit of Gumby, these comics are for all ages. 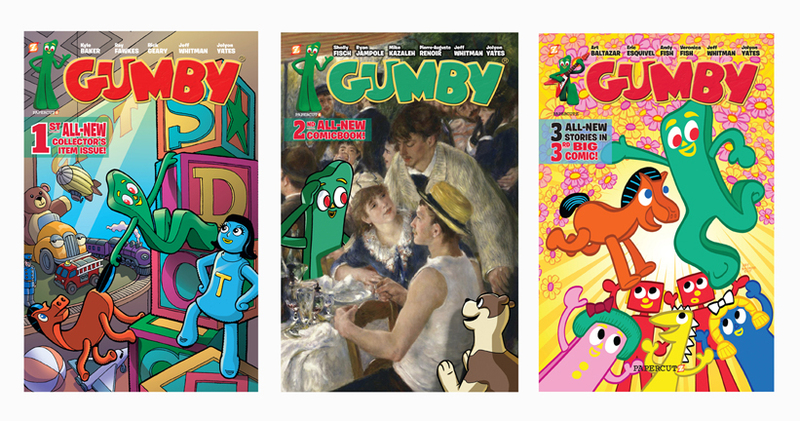 Each issue features three unique stories that harken back to the spirit of the original Gumby shows. 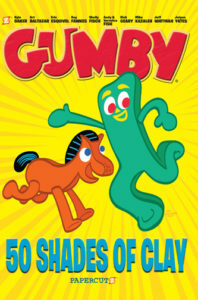 The books were created by talented comic all-stars, who infused their own unique perspectives on Gumby. Printed in very limited runs, these comics are bound to become collector’s items. >Get yours here before they are gone. The first story is Issue #1, “An Alien Abundance,” is written by Papercutz Assistant Managing Editor (and resident Gumby fanatic) and illustrated by New York Times bestselling artist Jolyon Yates. Gumby once again meets the triangle people from the very first Gumby episode, “Moon Trip.” Eisner and Harvey Award-winning cartoonist Kyle Baker has written and illustrated (in his unique art style) a story entitled, “Model-y Crew” in which Pokey brings home a model he meets at the supermarket. 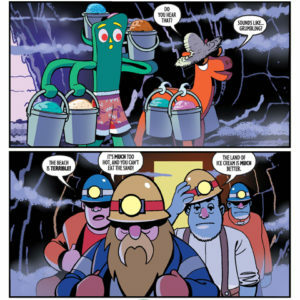 Acclaimed writer Ray Fawkes and Jolyon Yates worked together to create a fun adventure about Gumby and Pokey in the land of ice cream for the third story. Veteran Gumby comics illustrator Rick Geary (who contributed to Gumby Comics in 2005) created the whimsical cover illustration. Issue #2 follows with “Goos’ Gone,” in which our hero and his friends take a whirlwind tour of Paris in search of the Goo, who’s missing. Jeff Whitman (writer) and Jolyon Yates (artist) teamed up for this opening story. Mike Kazaleh’s story, “The Sour Note,” refers to a character from the ‘60’s Gumby series, who is a throwback to Paul McCartney. 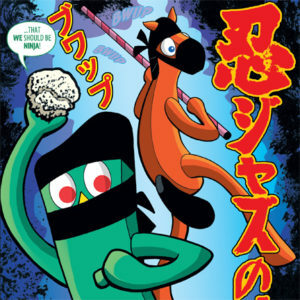 Next, Gumby and Pokey become Ninja in “All That Nin-Jazz” in this third story by Sholly Fisch and Jolyon Yates. The cover features a well-known painting by Pierre-Auguste Renoir with some comical updates by Ryan Jampole. In Issue #3, Gumby turns “Green with Envy” when a fellow musician woos Tara. Yes, even Gumby can lose his cool once in a while. Eric Esquivel, a true-green Gumby fan, put pen to paper in this opening story, while Jolyon Yates whipped up these dramatic illustrations. Andy and Veronica Fish wrote and illustrated, “The Treasure of the Obellos” in which Gumby goes for a deep sea dive. In “Gumby’s Gran Adventure,” written by Jeff Whitman and illustrated by Jolyon Yates, Granny takes Gumby on a trip to Hawaii orchestrated by the Blockheads. You won’t believe what those troublemakers are up to now. Art Baltazar created the whimsical cover art. The stories from Issues 1-3 were compiled into a graphic novel format to create, 50 Shades of Clay. Gumby’s first graphic novel! Writer Jeff Whitman shared his Gumby wisdom with an interviewer with Freaksugar. You can read more about these incredible artists and writers on the Papercutz’ website. “Captures the feeling of old cartoons. There is a strong emphasis on friendship, energy, and a touch (or several) of the charmingly weird.” – Adventures in Poor Taste! “As someone who grew up with original old-school Gumby adventures, and then raised a second generation Gumby fan through the new adventures, we have collected all the Gumby comic books over the years, the 3D issues and Gumby Gang stories, but we are happiest with this new series from Papercutz that really gets back to the heart of Gumby! All the old characters we know and love are back, along with the new generation favorites, the Clayboys, Lowbelly, Tara and Ginger. Each story is uniquely handled by fun contemporary artists like Kyle Baker, Eric Esquivel, Andy and Veronica Fish, and Jeff Whitman’s stories are spot on classic Gumby! The right blend of old and new is there as we catch up on what Gumby, Pokey, Prickle and Goo are up to nowadays, imaginative and clever, this collection is a great way to introduce your kids to Gumby.” – Brenda R.
“Great stuff! The creative teams behind these stories really show off their passion for all things Gumby. As a newcomer to the Gumby-Verse, this was a great jumping-on point for a new generation of fans to fall in love with Gumby. I’m sure older fans will also enjoy all of the callbacks to more obscure characters and how these teams have captured the essence of the series. Can’t recommend it enough!” – Megan N.
You can get yours at gumby.com.